Fees associated with the UK PCT national phase entry as well as other patent fees are available in the fee calculator. The time limit for the UK PCT national phase entry is 31 months from the priority date. This term may be restored for two additional months providing that the failure to file an application under the PCT in due time was unintentional. The official language of the UK patent application is English or Welsh. If the patent application is filed in any other foreign language, the Comptroller shall notify the applicant that a translation into one of official languages should be submitted within two months from the date of the notification. - proof of payment of the corresponding fees. Currently, the legislation of the United Kingdom does not require filing a Power of Attorney when entering the UK PCT national phase. A copy of the international application is only required if the Intellectual Property Office of the United Kingdom hasn’t received a copy from the International Bureau. If the applicant is not an inventor, the statement of inventorship (Assignment Deed) should be provided within 33 months from the priority date. If the applicant requests early entry into the national phase, the statement of inventorship must be furnished within 16 months from the priority date, or 2 months from the date on which the conditions for early entry are satisfied, whichever is the later. The request for official search as well as the payment of the corresponding fee must be provided to the UK IPO within two months from entering the PCT national phase or within 12 months from the priority date. Patent applications in the UK undergo formal and substantive examinations. Request for substantive examination, as well as payment of the corresponding fee, must be submitted within 33 months from the date of priority. It is also possible to request an accelerated examination under PCT (UK) Fast Track system and PPH. A UK patent application may be filed within six months after the disclosure at an officially recognised international exhibition or when such a disclosure was made in bad faith by any third party. The evidence substantiating the display of the invention at an exhibition must be filed alongside an application. There is no official grant fee stipulated for UK patents. Patents in the UK are in force for twenty years from the international filing date. The first annuity is due on the 4th anniversary of the international filing date, but it is only payable at granting of the patent. Annual fees should be paid within 3 months before or 1 month after the due date to avoid late payment fees. Late payment is possible within a six-month grace period by paying a corresponding surcharge. The average processing time for patent registration procedure which has entered the PCT national phase in the UK is 30 months. Utility model protection is not available under the UK legislation. For foreign applicants residing outside the United Kingdom or the European Economic Area (EEA), it is recommended to perform the patent prosecution through a registered UK patent attorney, or a foreign lawyer, provided that he has an address for service within the EEA. 1. Online Search Databases: UK Patents, European Patents (EPO). 2. European Patent is valid in the United Kingdom automatically. 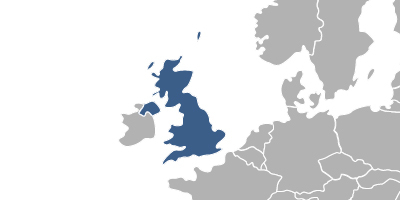 Please contact us if the above information contains any discrepancies with the UK IP Laws.